Every blog post get shared and discussed on different social networking community websites like digg, twitter, friendfeed. Ever wanted to know comments on your blog post from all over web? gReader Firefox extension allows you to read comments on your blog post made by users at different social networking and sharing websites. 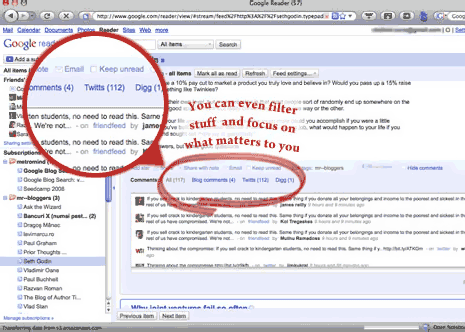 After install, it shows number of tweets, diggs and comments to your blog posts at the end footer of post listing in Google Reader. For each post in your feed it gets comments from the blog and services like: FriendFeed, Twitter, Digg, Hacker News, Reddit and many more. Download gReactions to see all comments for your blog posts within Google Reader, interesting!